Ryli VanHoveln, 5, was born a fighter. She had to be. Ryli VanHoveln and her mother, Holli. On May 21, 2013, Joe and Holli VanHoveln welcomed their daughter, Ryli, at a small hospital in Watseka, Illinois. But doctors soon realized something wasn’t right. Because of those two factors, they decided to transfer Ryli to the Neonatal Intensive Care Unit (NICU) at OSF HealthCare Children’s Hospital of Illinois. The initial focus for Ryli’s care was to provide proper nutrition because her cleft palate made eating difficult and to help with her breathing. While Ryli was in the NICU, doctors ordered an echocardiogram on her heart. “It was the answer to everything,” Holli said. The echocardiogram showed Ryli had two congenital heart defects – coarctation, or narrowing, of the aorta and ventricular septal defect, a hole in the wall of the heart’s two lower chambers. Ryli was put under the care of Dr. Ty Hasselman, pediatric cardiologist at OSF Children’s Hospital, who assured her family her heart condition could be fixed. At just 17 days old, Ryli underwent her first surgery to repair the coarctation of her aorta. “When your newborn undergoes heart surgery, you have to put your faith in God and in the surgeons that they are going to do their very best,” Holli said. Less than six months later, Ryli had her second surgery to correct her ventricular septal defect. Both surgeries were a success. Today, Ryli is a social butterfly. She’s enjoying her second year of preschool and looking forward to starting softball this year. Now, Ryli only requires a yearly checkup with Dr. Hasselman. 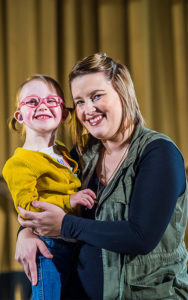 Watch a video of Ryli’s triumphant story of the heart at osf.healthcare/ryli.